Slow love was slowly made me wnt to pull my hair out. Don’t get me wrong this book was very well written and I did enjoy it. I just get frustrated with smart women making stupid choices. I am talking about her ten year on again off again relationship with a character affectionately named Stroller. 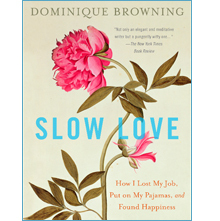 In my mind Dominique Browning is nothing short of a genius. As the former editor of Home & Garden she had the life I, as a not so great writer, could only dream of. She was a woman who could instill both awe and fear in me if I was ever lucky enough to meet her. The thing is she is an idiot when it comes to relationships. Don’t get me wrong we all have our past relationships that were, in retrospect, not the brightest of ideas. I know I had a few Stroller’s in my life. The thing is even at my lowest points I never spent one minute, much less ten years with a married man. I mean for goodness sakes she saw him at the Met and he introduced her to his wife. Does that sound like someone about to leave her for good? The book intertwines delightful tails of cooking, dreams of a truly great bran muffin, and the idea of taking your time to experience the joy and rituals of just cooking something. Sadly, the delightful aspects of the book are interrupted with mentions of Stroller and the horrid ways he keeps on treating her. She even talks about him in the acknowledgements. It makes you wonder if after everything she really did finally let go of him and find the “Slow Love” she claims.